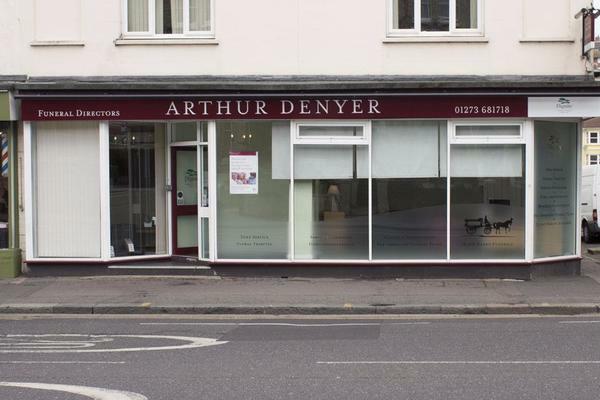 Arthur Denyer Funeral Directors in Brighton is here to provide comfort and support at a difficult time. We would be honoured to arrange a dignified and heartfelt funeral for your loved one. The loss of somebody special can have a considerable impact upon a life. You may presently be experiencing feelings of uncertainty or apprehension at what happens next and what steps to take in arranging a funeral. Our team of funeral directors will help to ease your concerns, providing kindness and reassurance, letting you know you are not on your own when it comes to making decisions regarding the funeral. However you wish to mark your farewell, we will ensure the ceremony is a unique and personal tribute to your loved one’s life. Established over 110 years ago, Arthur Denyer Funeral Directors is proud to have served the communities of both Brighton and Hove during this time. Our funeral home can be found on the Lewes Road, adjacent to St Martin’s Church, and we are within easy reach of all districts within the towns, including Bevendean, Brunswick Town, Hollingbury, Kemptown and Woodingdean. Should you wish to spend some time with your loved one prior to the funeral, we have a chapel of rest available, which provides a peaceful and private space in which to do so. We are also able to offer funeral care to our Muslim community, with our funeral home equipped with the necessary provision for the practice of washing and shrouding. If you are in Brighton or the surrounding area, get in touch with us today. Our sympathetic team of advisors is here to talk, 24 hours of the day. Call us today on 01273 681718 to talk through your personal requirements. At Arthur Denyer Funeral Directors, we understand how special life is with those that you love. For us, every funeral is unique and personal. We have a service to fulfil every wish, with every detail carried out with the same uncompromising quality of care. From a traditional service, to a colourful woodland burial, your options are limitless with our Full Service Funeral. If you have a little more flexibility when it comes to arrangements, then we can provide a Simple Funeral for a lower cost. We are on the corner of Lewes Road and Trinity Street, next to St Martin C of E Church. Our staff are available 24 hours a day on 01273 681718 if you require our services outside of these hours. The service provided was outstanding – respectful, understanding and practical. The staff took time to listen and to explain which made arranging the funeral we wanted an easier, less daunting experience. I found all the people that I had dealings with a Arthur Denyer were extremely helpful and understanding at such a challenging time. Everything was handled in a thoroughly professional way and no problem or query was too small. I would have no hesitation in recommending them to anybody.